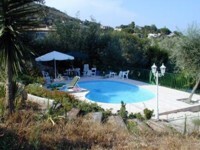 The villa in Capitou that we stayed in. Nice large villa, but no air-conditioning or ceiling fans. No fans available in shops and temperatures over 32 deg C! The villa had a crackin' pool! At least there was one way to keep cool other than getting in the freezer! 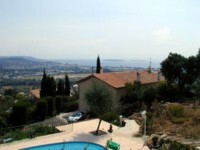 This is taken from the road behind the villa and shows the truly amazing view across Cannes. Whether night or day it was quite spectacular, if you were lucky you got a late-night firework show too! The beach at Cannes. It was small, but the sea was shallow, especially by the Chateau in La Napoule.